Staff Selection Commission had released latest notification against File no. File No. 3/1/2015-P&P-II for recruitment of the posts of Lower Division Grade Group C Staff for Grade pay Rs. 1800/- in the various government departments on the basis of performance of Departmental Competitive Exam which will be held on 05th April 2015 (Sunday). Applications are invited for vacant posts of Lower Division Grade Group C Staff on the prescribed format on A4 size paper sheet which can be downloaded from the direct link provided in the end of the post till 16th February 2015. SSC LDG Exam will be conducted on 05th April 2015. The SSC LDG Exam will be conducted by Pen MODE. In the selection preference will be given to higher age of employee (in case of obtaining equal marks) and the list will be released in alphabetic order by name. SSC LDG Exam 2015 will be provided in bilingual Language i.e. Hindi and English. 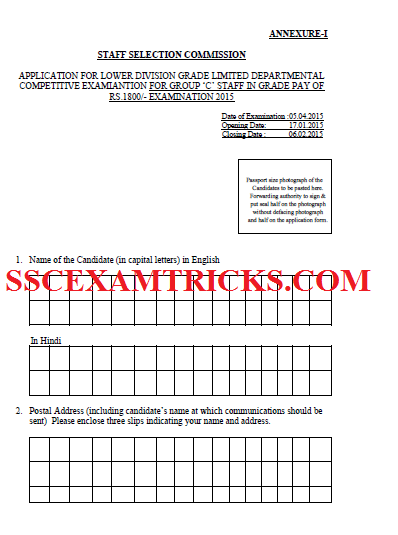 SSC LDG Exam 2015 will be conducted two papers i.e. Paper I & Paper II. Paper I will be short essay (English/Hindi) of 100 marks and will be conducted in morning session i.e. 10:00AM-11:30AM. The total time duration for exam will be 1 ½ hours or 90 minutes. Candidates will have to write an essay of 400-500 words on some specified subjects. Paper II will be objective type multiple choice question paper. There will be an OMR sheet to be filled by Blue/Black ball point pen. The exam will consists of various sections English/Hindi Language (50 questions of 50 marks) and General Awareness (50 questions of 50 marks). The exam was a multiple choice question paper of 100 questions of 100 marks and four options were provided out of which candidates need to choose one correct answer. The time duration was of 2 hours or 120 minutes. Negative marking will be 1/4th to deliver each wrong answer in exam. Paper II will be conducted in evening session from 1:00PM – 3:00PM. For more information candidate must download syllabus and exam pattern of SSC LDG exam from the official website. The qualified or short listed candidates will be called for typing test. The candidates will have to qualify typing speed of 35 w.p.m. in English or 30 w.p.m. in Hindi.